Here we come, baby, and you'd better run. We're The Green Fuz! 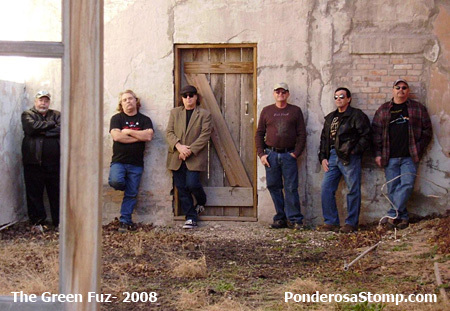 The group that would become the Green Fuz came to life in Bridgeport, Texas in 1967 when ringleader/vocalist Randy Alvey and drummer Mike Pearce started a short-lived band called the Psychotic Reactions. After bringing aboard guitarists Les Dale and Jimmy Mercer and bassist R.E. "Buck" Houchins, and noting that Les derived much of his sound from a very ugly green fuzz tone box, the Green Fuz was born. They gained popularity gigging at parties and on the teen club circuit, finally being approached by local music hustler Shorty Hendrix. Hendrix's specialty was country music—he often showed up at the Fuz's gigs in rhinestone-studded western attire—but he knew a good thing when he saw it, and soon contracted the band to cut a single for his Wash-Tex label. Foregoing anything as simple as recording in a regular studio, the now-notorious scene-of- the-crime was a native stone café on Highway 199, conveniently closed for remodeling. The stone gave the place a huge echo, forcing the band to record at a much lower volume than they were used to. Pearce had to muffle his drums with towels, contributing even more "atmosphere" to the band's forthcoming record. When it was released, the band was initially under whelmed by their efforts, shortly thereafter morphing into Natchez, which specialized in a harder brand of psychedelic rock. Meanwhile, unbeknownst to those who had created it, "Green Fuz" began to take on a life of its own. In the late '70s it appeared on the garage compilation Pebbles Volume 2, becoming a punk anthem for a whole new generation when the Cramps covered it on their 1981 album Psychedelic Jungle.